St. Mark’s Church was originally built in 1836, in the Gothic style, the date of which can be found on the tower above the west door. The nave, small apse and western tower were consecrated on August 13th 1837. In 1876 the foundation stone of the new chancel and organ chamber was laid. This stone can be seen outside underneath the East Window. The present choir vestry was built in 1933 from stone belonging to the old Kelsterton Brewery, kindly donated by Mrs. Charlton of Plas Bellin, Northop. Between 1974 and 1975 the Memorial Gardens were laid out and the gravestones were removed and placed in two rows behind the church. The lych gates and limestone wall were then moved back towards the church in order to form the lay-by. The lych gates were constructed in 1917 in memory of the Reverend Thomas Williams, vicar of Connah’s Quay from 1874 – 1909. His grave can be found at the far end of the churchyard by the Priest’s Vestry. The clock was originally made by J. Benson of London, and is believed to have been installed in 1837. In 1991 the mechanism was repaired and the dial face refurbished by Joyce & Co. of Whitchurch. The peal of bells, given in 1891 by Mr. and Mrs. Charles Davison to commemorate his year of office as High Sheriff of Flint, were finally removed in the late 1990’s having become unsafe. This was given in 1876 by James and Sarah Davison in memory of their son Cyril, who died in June 1865, aged 4 years. Mrs. Hodgkiss in memory of Cecil Baird donated the font cover in 1921.On the wall behind the Font can be found one of two icons painted by Sister Seraphim, a hermit from Holywell. This one is of St Mark, flanked by two angels. This was given in memory of Mr. Gordon Aspinall by his wife, Margaret in 1992. This book and case were given in memory of Alfred Prestidge, who died in September 1973. In it are the names of the deceased in whose memory various gifts were given to the church. The table next to the Memorial Book displays a remarkable selection of books, one of which is a Bible given by the Parkin family in 1924 and an Altar Service book that was given by Miss Bartley, the Headmistress of Connah’s Quay Infant School (now Dee View Surgery), in memory of her mother and sisters in 1936 on the occasion of the Centenary of the church. There is also an electoral roll from 1965 and a matching Bible and prayer book set. The window to the left of the font was placed there in 1912. This window was the central panel for the original East Window. The main panel shows the Crucifixion with our Lady and St. John on either side of the Cross, and is in Mediaeval style. Above can be seen an illustration of Jesus in the Temple when he was twelve. Below can be found the Nativity scene. The next window formed the right hand panel of the former East Window and depicts the Resurrected Lord. This window has been set in plain diamond shaped leaded lights to accommodate the larger frame. The main feature of this next window is a scene showing King David playing a harp, taken from 2 Samuel 1. Above the central panel is the figure of St. George, Patron Saint of soldiers, slaying the dragon, above which can be seen the Standard of the Royal Welch Fusiliers. At the base of the window can be seen the Bate family motto – “Live to Live”. The window is in memory of Lt. Roger Whiteley Bate, whose memorial plaque can be found next to the window. The final window on the left side of the Nave is unique. The main panel shows Jesus by the Sea of Galilee calling the three disciples, Peter, James and John. The face of the disciple James has been replaced by that of James Davison, taken from a family portrait, and in whose memory the window was erected in 1871.At the side of the window stands the Mothers’ Union banner for Connah’s Quay. One banner is in ivory and gold. 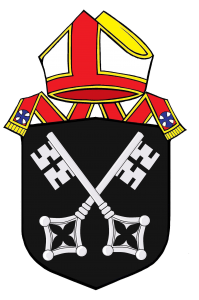 This alternates with a blue one, which features the Virgin Mary, which is kept at St. David’s when not in St. Mark’s. On the top of this large oak desk can be found an assortment of books. 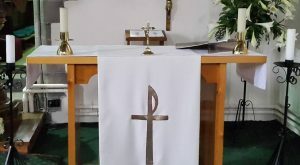 There is a large Holy Bible with metal clasps, the Holy Bible on the stand at the centre was originally given for the pulpit and presented by Mr. and Mrs. Wilfred Evans on September 20th 1936 in thanksgiving for the Centenary of the church. Mr. Evans was the Headmaster at Connah’s Quay Infant School. There is also a Holy Bible that was given in 1970 in memory of Arthur Jones, a chorister for 60 years, and a Book of Common Prayer from December 1913.Underneath the desk is a wedding kneeler that was given in 2001 by Ivor and Barbara Radcliffe to commemorate their Ruby wedding anniversary. 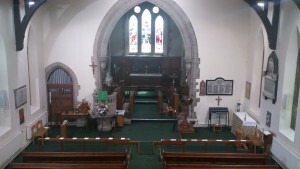 The oak kneeling desk to the left of the desk, and the one on the opposite side of the Nave were given in 1989 and 1990 in memory of Hilary St. John Heggs and Hilda Povey respectively. The chairs are two of a set of four that were given in memory of Matthew Vickers and Doris Owen. The pulpit is made of Caen stone with carved and pierced panels. It was given in memory of Edward Bate, who died June 25th 1876. The inscription “Go ye into the world and preach to every creature” is from St. Mark’s Gospel. The light was reconstructed in 1970 in memory of Arthur Jones. On the wall above the pulpit is an oak cross with a brass corpus. This corpus replaced a plaster one, donated by Emily Cruckshank, which was broken in 1988. The plaque on the cross now commemorates her as well as James Cruckshank. The small oak credence table at the side of the Altar was given in memory of Alma Thomas, by her sister Anne Thompson, in 1980This portable Altar is made from pine and stands in the centre of the dais between the pulpit and the lectern. It is used at the 11am Eucharist services. It is positioned underneath the War Memorial for occasions such as weddings and funerals. The two oak stools at the beginning of the choir stalls were given in 1981 in memory of Wilfred Leighton Walker, a church member for 72 years, by his wife. The choir stalls themselves are made from oak, and have the same carved design as the Communion rails. At the end of the choir stalls on your right can be seen the Processional Cross. This was given in memory of the Reverend and Mrs. Bowyer. The Reverend Bowyer was vicar of Connah’s Quay from 1953 – 1965.Whiteley Brothers of Chester built the organ, on your left, in 1879. It was renovated in 1974 in memory of the Parry family of Pentre Golftyn Farm and restored in 2000 through money raised by the congregation and local businesses. At the side of the organ can be seen a pictorial record of the pew rents for St. Mark’s in 1838. Note the number of pews, and the fact that 300 of the 500 seats available are not allowed to be rented at any time. The plaque at the side of the organ refers to the original reredos, which was given in 1878.The window on the left of the Sanctuary shows Jesus offering his blessing after the Resurrection with the greeting, “Peace I leave with you”. Below is a cameo of Mary and Martha at the tomb of Lazarus. The oak panels on either side of the High Altar were given in 1980 by O. W. Ellis and Miss H. Arnold in memory of her father, mother and brother. The present reredos was painted in 1924 and given as part of the refurbishment project, which included the extending of the then choir vestry, the repairing of the sacarium and the installation of choir seats. 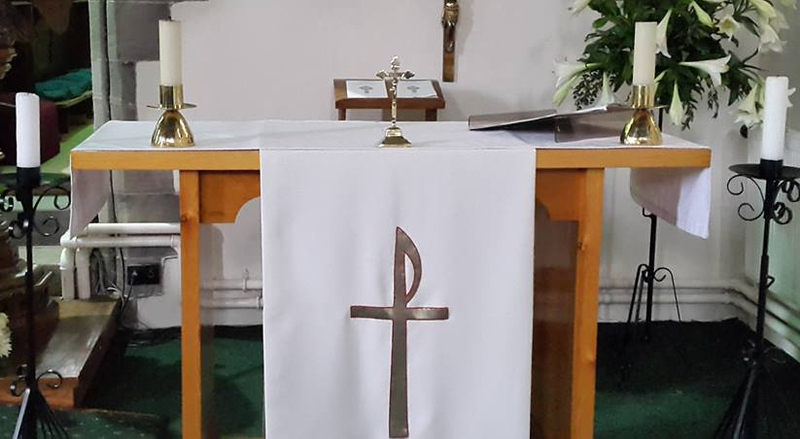 The credence table at the right of the High Altar, on which can be found the prayer book stand was given in memory of Vera and Paddy Welch. The intricately carved High Altar is made from oak and has five carved front panels. The main panel is overlaid with a carved cross and a crown of thorns. The outer panels on each side are in a Gothic window design. It was given by the choir in memory of those who fell in the Great War, a plaque referring to this can be found on the right hand wall, next to the entrance to the Priest’s Vestry. The brass cross and candlesticks on the High Altar were given in memory of Mary Joy Hurlbutt, who died April 9th 1911, by her son. The Aumbry and light, on the right hand wall of the Sanctuary were given in June 1980 in memory of Hugh King Taylor and Mary Hannah Evans. The large brass Offertory plate, kept beneath the window to the right of the High Altar, has an embossed cross and the four faces from Revelation in its centre. Around the edge of the plate is the engraved inscription “All things come of Thee and of thine own do we give Thee”. The window above the plate shows the angels of death reaping their harvest. One angel is carrying a sheaf; the other is holding a sickle. Strangely the angels wear the dalmatics of deacons and also priestly stoles. It was given in memory of Sarah Jane, the wife of James Davison. Also in the Sanctuary can be found the Bishop’s Chair, one of the stools given in memory of Joseph Jones and a kneeling desk, both made of oak. The kneeling desk was given in 1939 by the Reverend R. D. Hughes and Captain I. T. Prince, Organist, in thanksgiving for recovery from illness. The Communion rails, also made of oak, were given in memory of Miss Williams in 1922. The east Window was erected in 1912 in memory of Thomas Bate and depicts Jesus the Good Shepherd, the Crucifixion and Jesus the Light of the World. The scene from the Crucifixion incorporates the Holy Spirit in the form of a dove. Above the other two panels can be seen the letters I H S and the symbols depicting Alpha and Omega. At the bottom of the three panels can be found the Cross of Faith, the Heart of Charity and the Anchor of Hope. The lectern is beautifully carved from oak in the shape of an eagle and was donated on September 23rd 1876 by Charles Davison. The oak base on which it stands was given in 1980 in memory of Sharp, Dean’s Close. The Bible on the lectern was given in 1971, in memory of Alfred Henry Ashcroft, by his family. The lectern light was given in 1970 in memory of James Parry of Pentre Golftyn Farm. The public address system for the church was given in 1976, also in memory of James Parry. This portable font is used at virtually all baptisms in the Parish Church. The bowl is made from copper and the stand is made from one of the pitch pine pews from the body of the church. It was designed by the Reverend D. P. Morris, a former vicar of the parish, and given by the Men’s Society in 1989. The War Memorial, positioned to the south of the Nave arch, is made of white marble, and was erected in 1920.A poppy wreath is placed at the base of the memorial every Remembrance Sunday. Directly below the memorial is a crucifix. This wooden cross has the figure of Christ dressed as a priest, with the crown of a king. Next to the memorial is the Votive Candle, the stool at the side of which, matches the one in the Sanctuary. The Votive Candle stand was given by Betty and Wynne Cotton in thanksgiving for the 150th anniversary of the church in 1986. The window to the right of the War Memorial, like the stone font, is in memory of Cyril Davison. The top panel shows a stylised figure of the child being borne heavenwards by two angels into the open arms of our Saviour. The central panel shows Jesus calling the children to him and bears the same inscription as the font. The next two windows are in memory of Ellen and Charles Davison. The bottom panel of these two windows are identical and carry the Davison family coats of arms and motto – Probitate Et Labore. Ellen was obviously a woman of good works, thus the main panel illustrates Dorcas with her friends. The text is from Acts 9 v.36-39.The window in memory of Charles illustrates the Presentation of Christ in the Temple. The window given in 1917 in memory of Charles Hurlbutt, a Colonel in the R.W.F., shows Jesus healing the Centurion’s servant. Charles was a favorite nephew of Charles Davison and inherited the estate at Farfield before his death. The Hurlbutt family coat of arms can be seen on the bottom panel of the window. The next window completes the former East Window. The left hand panel depicts the disciples gazing up after the Ascension of Christ. The heavy pitch pine pews were installed in the Nave in 1876, following the building of the new Chancel. There are now only twelve rows of pews on either side of the church. On each side of the Nave, at the front of the pews, there are lightly stained kneeling rails that were given in memory of Mary Elizabeth Ashcroft and Nancy Mitchell. These are used as Communion rails at the 11am Eucharist services. At the far end of the Nave, above the Children’s Corner can be found the second of Sister Seraphim’s icons. This one is of the Holy Family and was given in memory of Austin and Annie Evans in 1992.At the back of the pews, opposite the icon can be found the prayer book cupboard, given in memory of J. B. Hughes by his sister Mrs. M. Chambers. On top of the cupboard stands a model of the church done by R.W. Hewitt of Kings Road in 1973. Looking up from the Nave the Memorial Doors that form the entrance to the gallery are clearly visible. These doors were erected in 2000 with money given in memory of the deceased of the parish. Through these doors can be seen the stained glass window with the stylised symbol of the Evangelist St. Mark (the lion with book). On the left is the lily and on the right a white rose, these are both symbols of the Virgin Mary. On either side of the doors, immediately behind the pews, the gallery windows are made of small squares of opaque leaded glass in pale green and cream. A noticeable feature of the windows is the patches of black paint that adhere to them. This was used to black out the windows during the Second World War to prevent light from inside being spotted by enemy aircraft crews. The remains of the blackout paint can also be seen, from the gallery stairs, on the main window. At the top of the gallery stairs can be found twelve Standards from various local organisations. Access to the gallery is through the pair of glazed doors at the end of the Nave, which were donated by the Beetle Club in 1961.In front of the green and cream windows can be found two models of the church. The church on the left hand side was done by Stephanie Pratt. The church on the right hand side shows the church as it was before the extension in 1876. As you leave church you can see the flagpole, which was given in memory of Maurice Hall. Graves of interest on the left include the Bate family vault, the pink marble pillar of ship builder Daniel Ferguson and his wife Elizabeth, the casket shaped tomb of the Reverend Morgan Davies, which has information about his life on the front, the stepped tomb with cross of the Reverend Thomas Williams, and to the left of this the grave of Charles and Ellen Davison. A number of the graves have small, unusual poems on them, and are well worth a look.